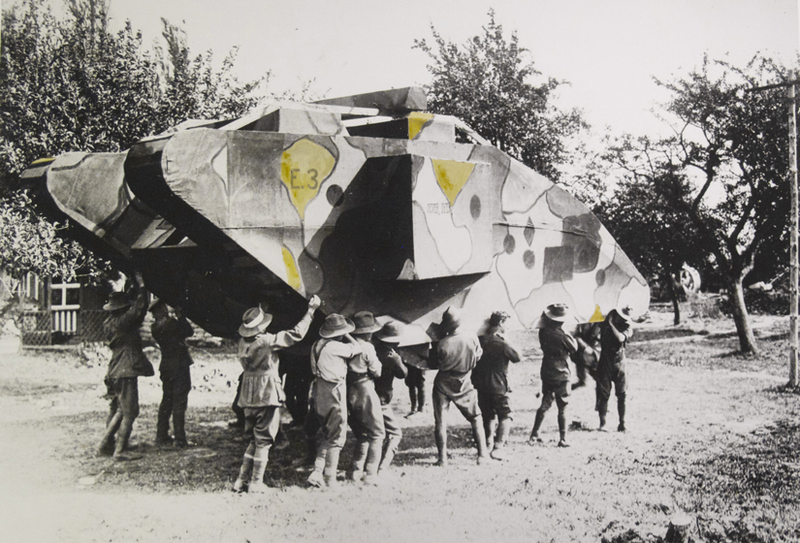 Italian artist Rä di Martino’s first UK solo exhibition, 'Authentic News of Invisible Things' presents a new body of work inspired by her research into the history of 'dummy tanks'. It is a little known fact that such devices, variously made out of a range of rudimentary materials such as wood and fabric, have been used throughout the history of modern warfare. 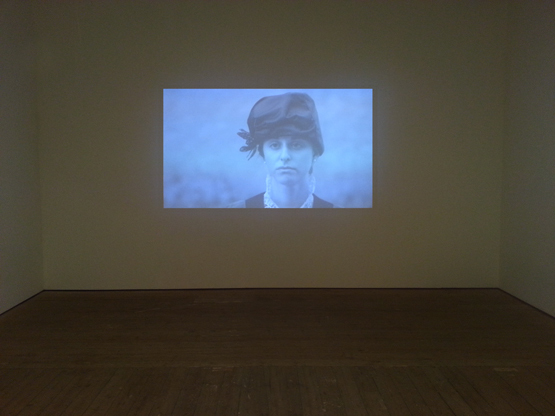 Drawing on and appropriating archive sources, she examines the peculiar status of these mock-machines. The realities of war demanded the creation of a fiction. Armies have employed these fake tanks in order to cheaply achieve a real tactical advantage by deceiving the enemy looking down from above in planes, helicopters and now via drones and even satellites. Despite this introduction of fiction into the reality of war, di Martino identified that in a bizarre contrast filmmakers have predominately shunned stage props where tanks are concerned and instead opted for the real thing. 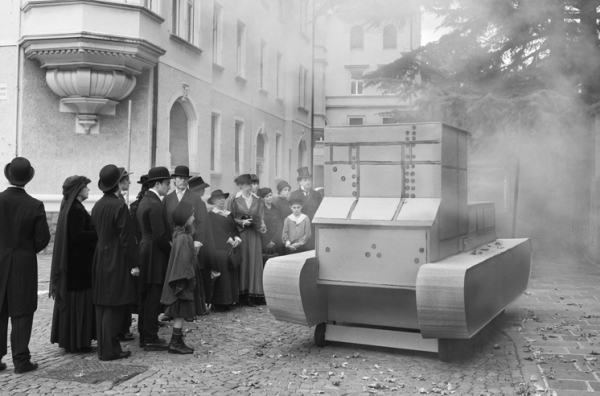 The video work Authentic News of Invisible Things is inspired directly by archive footage taken in the French City of Lille in 1918 which depicts a group of civilians gathered around a dummy tank abandoned by the retreating German army. Recreating and filming the historical scene in black and white, she pulls back switching to colour to reveal the cinematographer's devices. This contemporary footage is then interlaced with the original to create a complex dialogue between layers of reality, fiction and staging that simultaneously corroborate and mock one another. 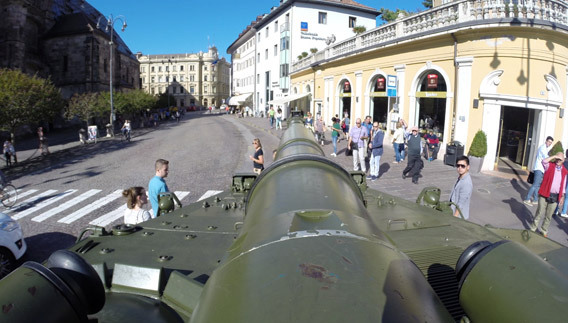 The effect is a reassuring distance between the observer and the image; a distance that the artist undermines in a further channel of video when a real tank is driven into the streets of the sleepy Italian town of Bolzano and the reactions of local inhabitants is recorded. This final gesture takes the work full circle, creating real encounters between people and an actual war machine but without the context of battle. Alongside her video, Rä di Martino has variously appropriated archive images of dummy tanks being constructed and maneuvered​. 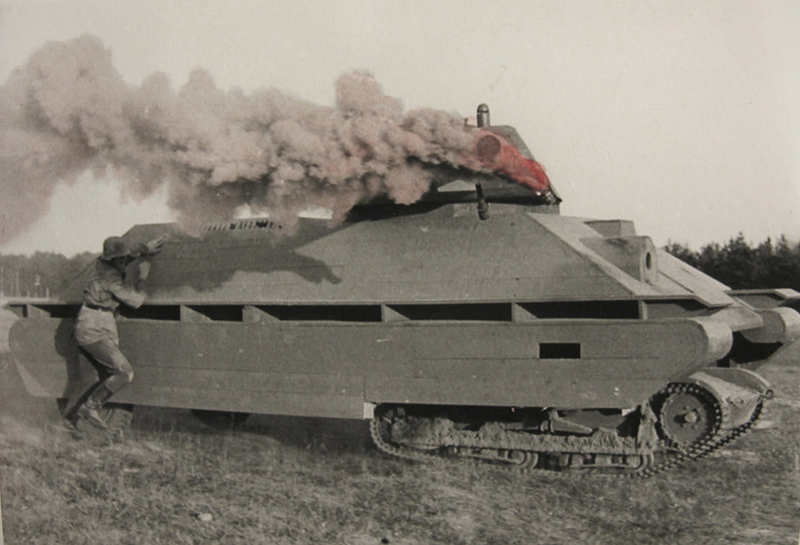 These manipulations re-introduce some small part of the real material used originally to construct the fake tank. From wood to pigment these minimal insertions add further layers of representation to the images asking us where we place the marker of ‘reality’. Despite being made to look imposing from a distance, the structures were lightweight and predominately hollow. The incongruous images of small groups of soldiers easily carrying what appear to be great tanks above their heads or drawing them along with a single horse give a momentary lightness to the memory of war – an absurdity. And yet, the images show a great humanity; an ingenuity capable of conceiving the supports necessary to substantiate fiction – something that no other species is capable of. Winter closure: 15 December - 15 January.